Whitehill Stream and the area often described as Westlea brook has been the focus of attention recently. At the November Leisure and Amenities Committee, Councillors listened to a statement read out by Cllr Steph Exell from the Environment Agency detailing work they had considered for Whitehill Stream. The Committee agreed to further monitor the situation. Thames Water held an engagement session this week to promote work in the area to reduce flooding in Moresby Close. 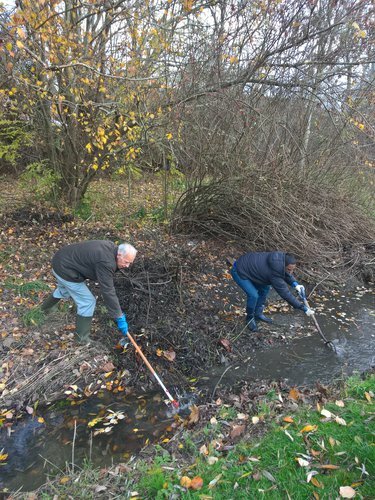 Cllr Suresh Gattapur has been working hard with residents to tidy up the area around Westlea brook this week.